Gang tattoos are still an underground practice and many tattoo artists won't do them. Even finding pictures of them on the web is a challenge. Gang tattoos mark a person as part of a street gang or a prison gang; they symbolize membership and represent the wearer's beliefs. Sometimes they also record acts of violence or even murder. 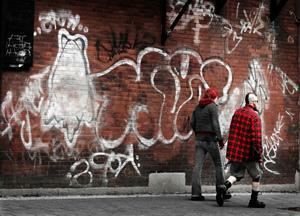 Every gang has its own set of tattoos and markings. A few symbols, like a teardrop under one eye to represent either a murder or the death of a loved one, cross gang boundaries. But for the most part the gang-related ink represents specific beliefs or gang affiliations. When a gang member gets a tattoo, it's often done by another member, an affiliated tattoo artist or a fellow inmate in prison. Both the person doing the tattoo and the person getting it know what it means. If you're thinking of getting inked with a gang symbol just for the sake of style, think again. Gang tattoos cause trouble in a number of ways. Local police, who are trained to recognize gang markings, may take your "fashion statement" more seriously than you intended. Rival gang members may mistake you for an enemy. Members of the gang whose symbols you borrowed may resent your use of them and react dangerously. For law enforcement officers, keeping up with the latest gang ink can be a challenge. Officers seem to be torn about the best way to share knowledge about these tattoos. Many police departments and gang investigation units choose not to make the information public, for fear gang bangers will use it. A few police and corrections officers have decided posting information and pictures, including photos of gang tattoos, on the web will help make tracking gang activity easier. The Florida Department of Corrections, which has illustrations specifically of prison gang tattoos, plus details about prison gangs. The Canadian Border Services agency has published a PDF that categorizes prison tattoos by the type of gang with which the tattoo is associated. It includes pictures and examples as well as what the tattoos mean. A few photographers have focused on gang tattoos, and you can find occasional magazine articles and books with pictures and information. 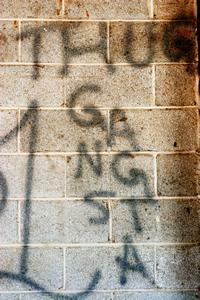 The November 1998 issue of Foto 8 has a photo essay of gang tattoos in Texas prisons. Gangs and Their Tattoos: Identifying Gangbangers on the Street and in Prison, by Bill Valentine and Robert Schober, has information about gang rules, codes of conduct, structure and tactics as well as numerous drawings and photographs of gang-related tattoos. Law officers have found the book useful for identifying gang members, and tattoo enthusiasts have used it to make sure they didn't inadvertently give or get a gang-related tattoo. Gang tattoos can make it difficult for a former gang member to get a job, make friends and otherwise succeed in life after leaving the gang. That's part of the reason for getting the tattoo in the first place: it's a permanent marker of belonging. But once someone decides to leave a gang, getting rid of the tattoo can be an important step. That's why some cities and several gang rehabilitation programs offer free or low-cost tattoo removal. In some places, a former gang member can do a set number of hours of community service in exchange for removal of a tattoo.